The photos in the album (or view individual pictures) are from a village in southern Haiti named "Bamachan". You won't find it on any map, or in Google. Rather, this small village is about 10 miles, by road, North of Les Cayes, Haiti. It is tucked into the mountains with much of the road being passable only on foot, 4-wheel drive vehicle or by mule. 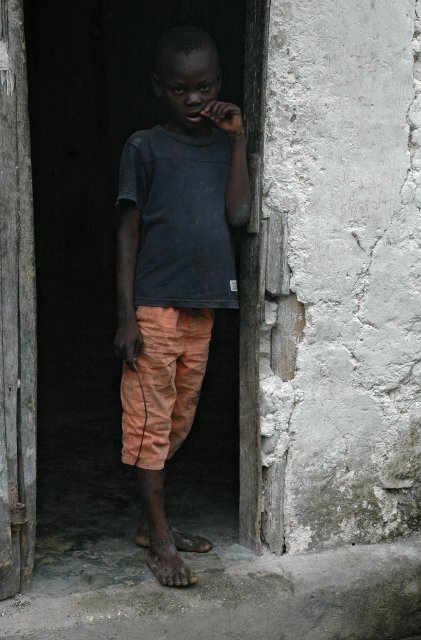 Today, Bamachan has about 1,700 residents who exist in abject poverty. There is no school; there is no clinic; no electricity; no water; no outside or indoor bathrooms; no doctors; no work; no money, and no food. The unemployment rate of this village is over 98%, and for those 35 residents who do work, their pay is less than $1.55 per day. The children in these photos do no go to school and do menial tasks throughout the day. In fact, we were the first white people many in the village can ever recall seeing. In 2003, the spring-well that served this village ran dry, and upon refilling in 2006 - the water has remained putrid and it is not used for any purpose. Rather, the children and women of Bamachan walk about a mile each way to fill their buckets from another well for washing, cooking and drinking. The small market where they purchase or barter for the little food they have is more than an eight-mile walk in each direction, which is open on Wednesdays and Saturdays. On Sunday, February 14th 2010 - Project Rennwish acquired and delivered over 1800 pounds of food, medicine and basic staples to this village, and as it hardly made a dent on the incredible need, returned once again on Thursday, February 18th 2010 to deliver another 1200 pounds of food and medicine. All the photographs were taken at that time and as a side note, on the last delivery, we also acquired 50 rolls of toilet paper. The sad truth is that all the children thought the rolls of toilet paper were "toys" to unwrap until they got to the center cardboard core (which they thought was the "present"), as they had never seen a roll of toilet paper. We had to do a little explaining what toilet paper is used for - for in Bamachan, the children have never seen or used a simple roll of toilet paper. As of today - Project Rennwish will continue to support Bamachan, and in fact, our first project is already underway. We have pledged to re-dig their well and replace their pump. Further, they are included in our meager food distribution program as we attempt, now with the addition of this village - to maintain a basic level of subsistence for over 5,000 orphans, women and men in our programs - on whatever food and medical supplies we are able to obtain.